US President Trump predicted that Republicans might ride a "Red Wave" to sweeping victories in the midterm elections, even as polls continue to show Democrats in the lead. However, many highlighted that Trump didn't know red wave usually connotes to periods. 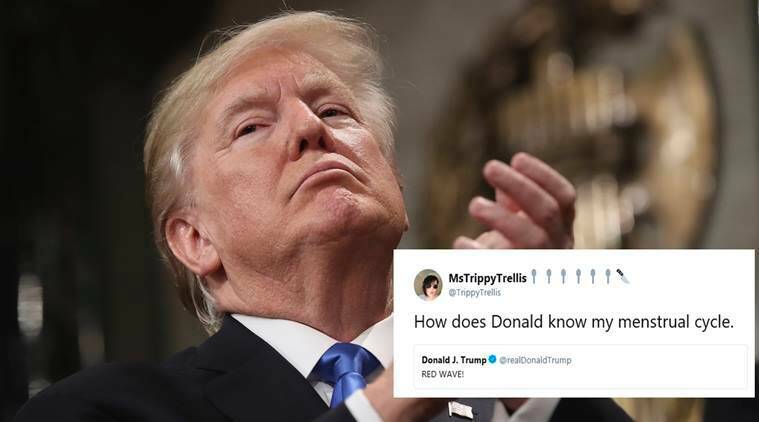 US President Donald Trump is no stranger to posting strange, cryptic tweets. Two of his recent tweets went viral with Twitterati going crazy with interpretations of their alternative meanings. Trump predicted that Republicans might ride a “Red Wave” to sweeping victories in the mid-term elections, even as polls continue to show Democrats in the lead. The tweet started attracting a lot of peculiar comments because the term ‘red wave’ is often associated with menstrual flow. Apart from many women, the Late Show also reminded the president about that. Others interpreted the tweet in their own way, using references ranging from Jaws to Putin. It actually started when the POTUS boasted that all five candidates he had endorsed in this week’s elections had won. His tweet just said: “5 for 5”. What was meant to be a positive message to his supporters, instead turned into a hilarious meme. While some thought it was an anecdote for all his “children”, others interpreted it as an offer at Wendy’s! Have something to add to this story? Tell us in comments below.